Insulin-like growth factor (IGF), as the name says is a peptide hormone that is very close to the well-known hormone insulin in its structure. However, despite its structural resemblance, it is quite a different thing. It has 100 times weaker glucose lowering action than insulin and has much stronger anabolic properties. Unlike insulin, it is primarily produced by the liver. It is related to HGH (human growth hormone) in a way that it is produced by the liver when it received a signal from HGH. HGH sends several signals to the body resulting in widespread growth. It stimulates the production of numerous factors that help the body grow faster. 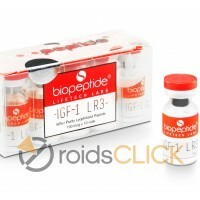 It seems that IGF-1 is one such factor that is critical for the growth stimulating effect of HGH. Nowadays, researchers have fully decoded the structure of this potent growth messenger. It is made up of 70 amino acids. It can be mass produced with the help of biotechnology. Humans hormones have specific limitation for use, whether to treat medical conditions or boost health. All human hormones are destroyed in the body within seconds or minutes. Thus, the body keeps pumping them in small quantities when and as needed. However, this means that if we produce exact copies of these hormones, they will have limited practical value, since using pumps is not a viable option. To overcome this limitation of hormones, researches add few extra amino acids to the structure of hormones. In this way, hormones do not lose functionality, but they can act for a much longer time. This is how researchers are able to create long-acting insulins. The same strategy helped researchers to prolong the action of IGF-1, and they added LR3 to it. Thus, naturally occurring IGF-1 acts for only about 10 minutes, and IGF-1 LR3 has a half-life of almost a day. It means that it can work for more than a day. Quite like its master, that is HGH, IGF-1 is also taken to stimulate muscle growth and promote widespread anabolism. IGF-1 is one of the most potent anabolics, and it differs from another anabolic in a way that it not only improves muscle hypertrophy, but it may also lead to muscle hyperplasia. Muscle hyperplasia means growth of entirely new muscle fibers. It implies that IGF-1 can even help overcome certain genetic limitations. Further, it is highly beneficial for cartridge repair. IGF-1 is a super compound that can be used both during the periods of heavy training or for recovery or rehab. Finally, it is important to note that despite so many great qualities, IGF-1 is not for beginners. In the beginners, anabolic steroids will produce much better and faster results. IGF-1 LR3 is something reserved for advanced users. It is for those who have been using many steroids for quite a long time, and now they need something extra to boost their performance. Usually, it is injected intramuscularly at the dose of 40 mcg a day and cycle last for a month. Even in advanced users, it produces good results when combined with steroids. Being insulin like substance, it has some downsides. It increases the risk of hypoglycemic state. Some may feel dizziness after using it. It also increases the risk of some cancers.